We represent “old school” craftsmanship coupled with “forward-thinking” strategies. Our core starts and ends with our industry-leading Engineering and Operations Teams. We are NOT your typical ‘sales-driven’ company. 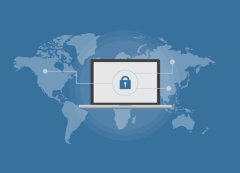 With our elevated awareness in Electronic Security (including its own security vulnerabilities), our designs provide maximum value for our clients. 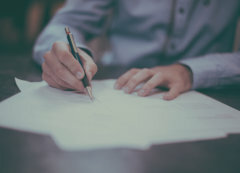 We also firmly believe that no client is too important or unimportant; we take as much pride in helping secure a Pre-School or Church as we do for a Fortune 500 Corporation. We offer very competitive pricing and do not get outbid very often! We empower our clients with critical knowledge, enabling them to make the best decisions with their security investments. 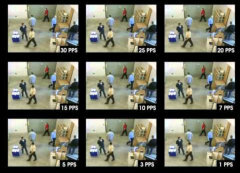 This video provides a great comparison of various frames per second (FPS) in IP Video surveillance. 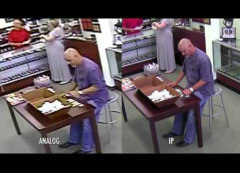 The key trade-offs when designing and installing IP Video include the quality of video evidence captured versus the bandwidth and storage infrastructure required to transmit and retain higher quality (FPS) video. 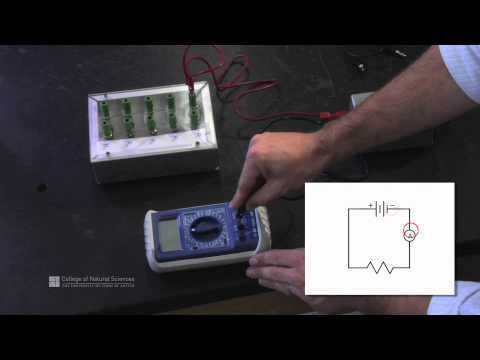 This section contains important content for technicians, but can benefit others as well. Feel free to browse! 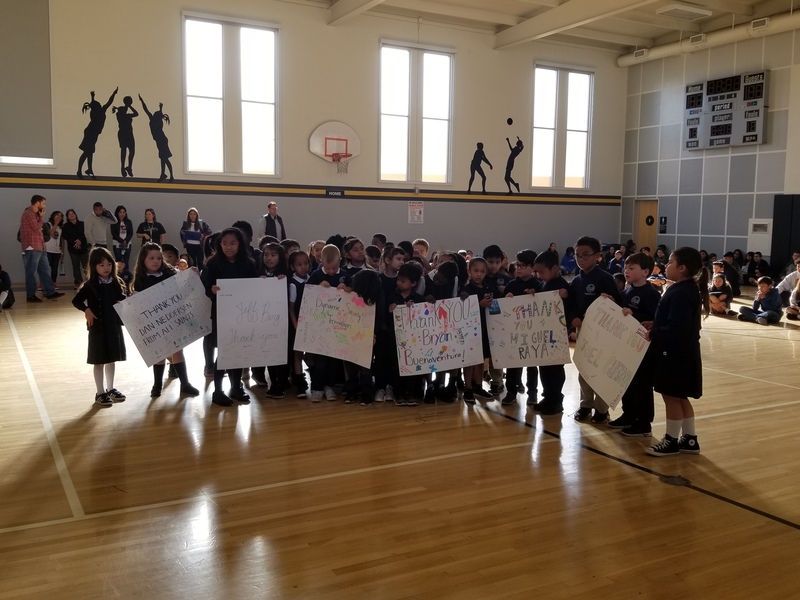 I wanted to send a HUGE thank you for your incredibly generous donation to All Saints Catholic School. I am a mom of a 1st Grader there. And knowing I’m leaving her now in a more secured environment makes me breath a bit easier. Thank you so very much! 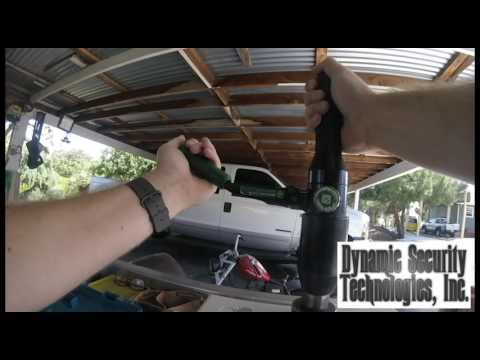 I worked with John and his team to install magnetic door locks with key cards at my school. They provided information and support every step of the way and were responsive with request for additional key cards. 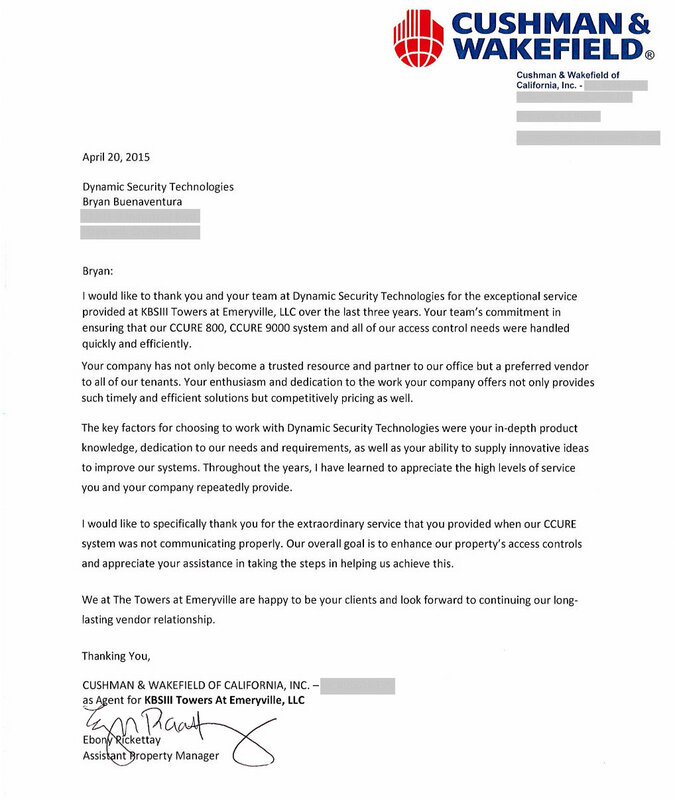 - Community Management Services, Inc.
We are pleased to provide a reference letter for Dynamic Security Technologies (DST). Over the past few years DST has worked with us on numerous security related projects. Each varying to some degree ofscope, size and classification –New Construction, Renovations or Service. 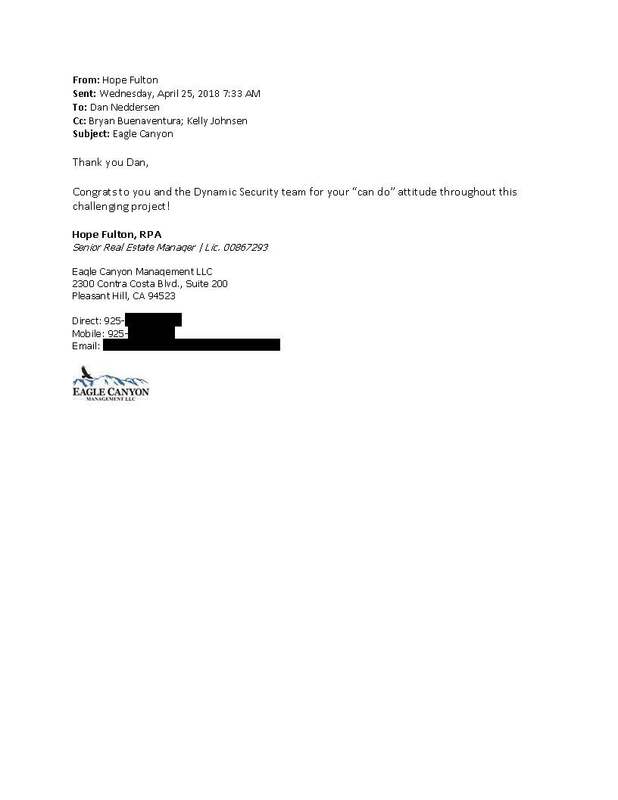 I would like to thank you and your team at Dynamic Security Technologies for the exceptional service provided at KBSIII Towers at Emeryville, LLC over the last three years. 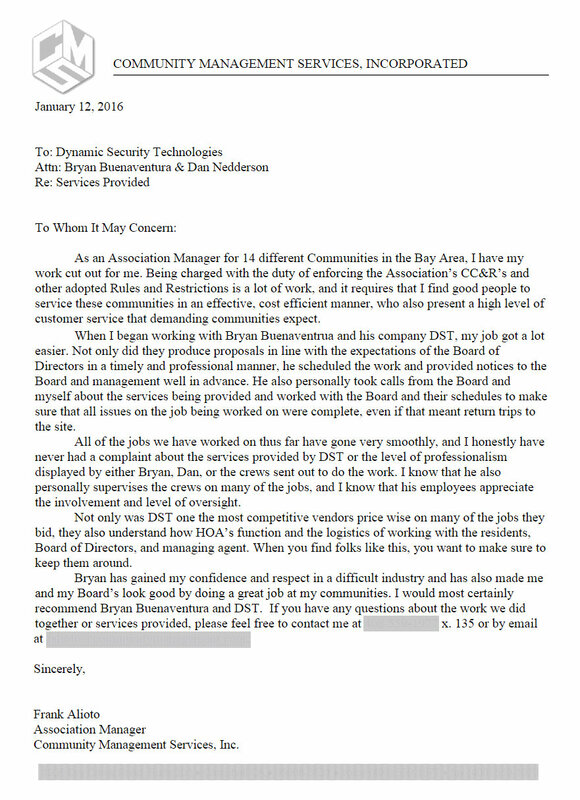 I was introduced to Bryan Buenaventura, when our need for reliable and responsive service had outpaced our existings vendor’s capabilities. 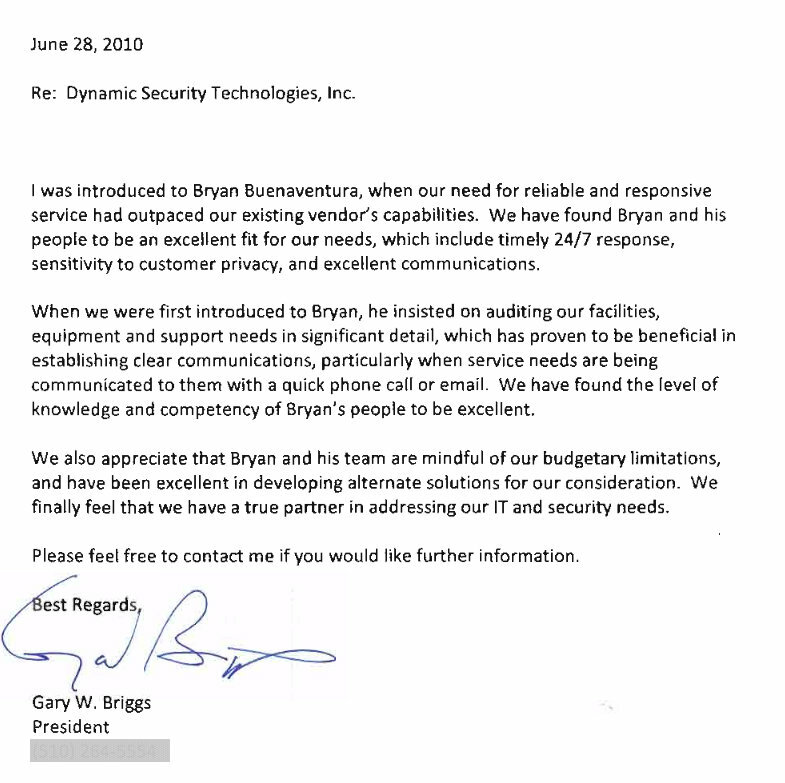 We have found Bryan and his people to be an excellent fit for our needs, which include timely 24/7 response, sensitivity to customer privacy, and excellent communications. 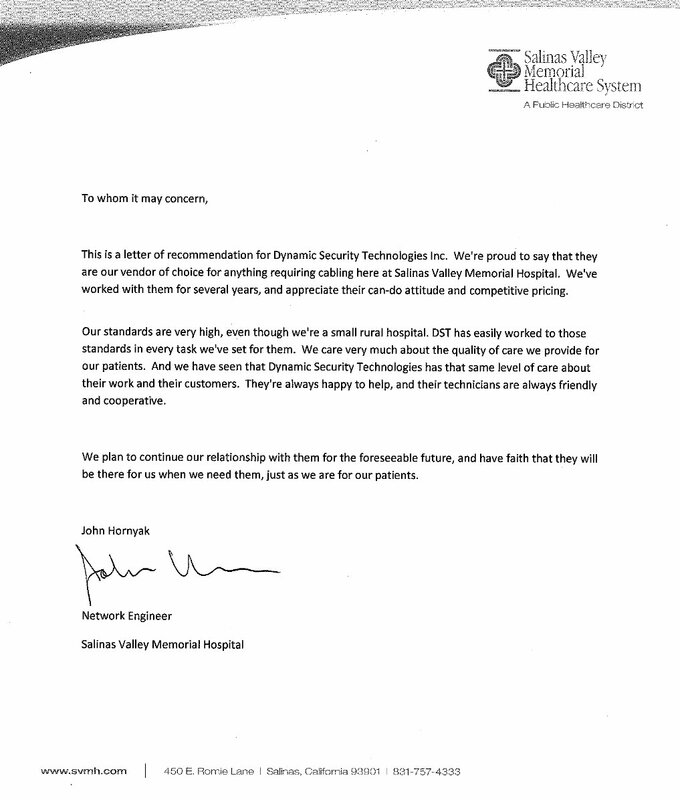 This is a letter recommendation for Dynamic Security Technologies Inc. We’re proud to say that they are our vendor of choice for anything requiring cabling here at Salinas Valley Memorial Hospital. We’ve worked with them for several years, and appreciate their can-do attitude and competitive pricing. 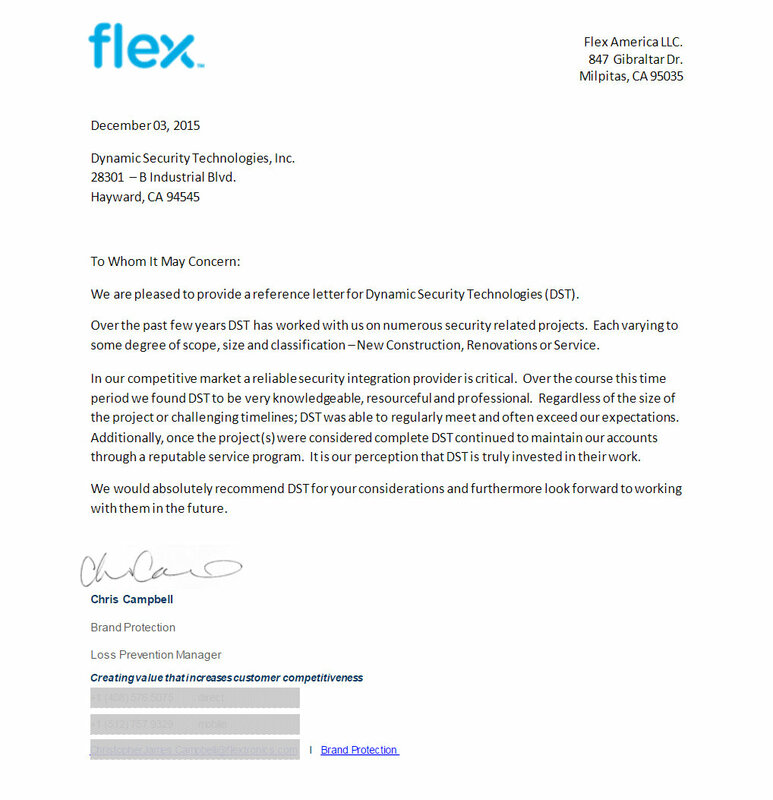 Congrats to you and the Dynamic Security team for your “can do” attitude throughout this challenging project! NEED A QUOTE? SERVICE? HAVE QUESTIONS?